Other parts are still I am satisfied. . This review is about item#29022063. I am happy that the size is abundant! This is nice again because there are small lot settings. Rust-free stainless steel. We will replace the bolts of Hara Hara with stainless steel. As there is strength, it will be less likely to screw down! This review is about item#41689261. Production of a small jig It is useful for the purpose of fixing a mount. This review is about item#29021966. Shape of head, size were just right, but choice of length is (3x30 next 3x45 next 3x50) Half-hearted feeling. This review is about item#41689076. Head size was just right for this time but choices of length were incomplete (3 × 30 next 3 × 45, The next is 3 × 50) feeling. This review is about item#41689067. Chiyoda size was also perfect, so it was saved. This review is about item#41689575. The number is not required so much, but the price is also cheap so use it for spare. This review is about item#41688665. 2.3 mm screws are hard to obtain and it is saved. . If the thread relation is not special one, PB goods of monotaro are enough. This review is about item#41688561. Goods with binding length are not seen much elsewhere. This review is about item#41688963. In order to install Concho in place of the jumper hook, the female side of the set screw is necessary, but the size is M4.5 X 4 mm. The screw that matches the set screw is M 3.5. However 4mm is not in the lineup, it used only at 6mm but it is still a bit long. I would like you to have 4mm size as well. This review is about item#41689103. This review is about item#41689042. Since it was available in short delivery time, we were able to make it in time for customer's delivery date. This review is about item#41689435. It may not have been necessary to be stainless steel, but it got a nice finish. When you want to fix the screw, use it for the part you want to remove the screw many times. There is no particular improvement request. I think that it is very convenient, I will repeat and purchase it. This review is about item#41688717. 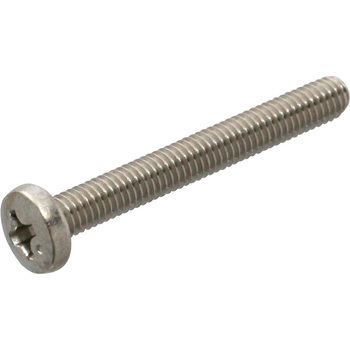 Generally, it is handy because it is a screw diameter that is not so much marketed. The old motorcycle turn signal is a screw of this size in general. This review is about item#41689033. Since it was in a small pack, it can be used without any problem for purchase and use. This review is about item#41689304. I think that screws are good without being rough.